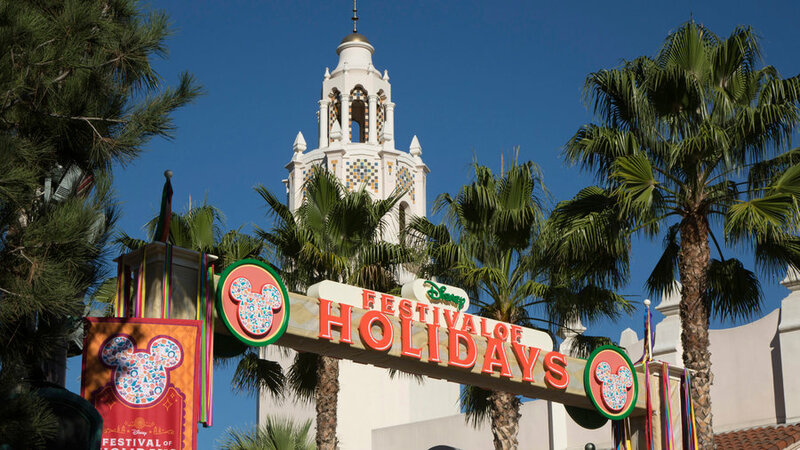 Disney's California Adventure Park celebrates the diversity of the holiday season with their annual Festival of the Holidays celebration. Beginning in November, visitors can glimpse traditions from across the globe and hear worldwide tunes from special guest musical groups. Taste the flavors of the season with internationally inspired bites at the Festive Food Marketplace and take part in the popular Disney ¡Viva Navidad! street party on the park’s Paradise Pier. 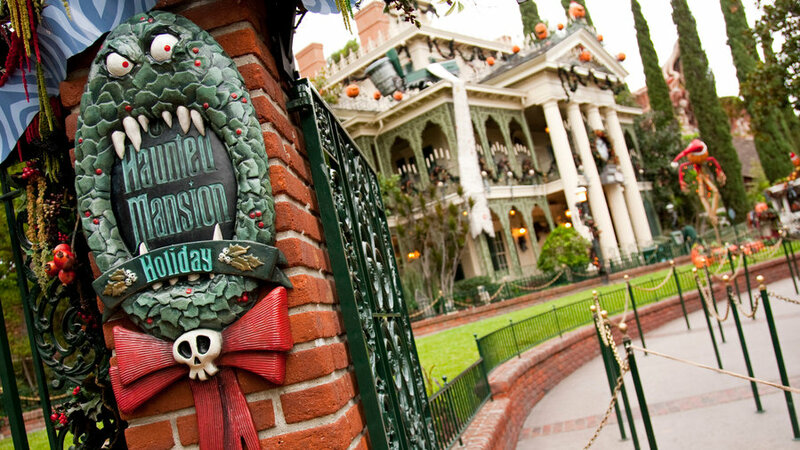 Starting in September, this spooky mainstay gets a Halloween-meets-Christmas makeover. Inspired by Tim Burton’s 1993 hit, The Nightmare Before Christmas, the entire mansion is transformed into a spooky spectacle, complete with jack-o-lanterns, wreaths, and kooky characters like the charming Jack Skellington. The mansion’s ballroom will also host a sweet surprise: a special gingerbread house that in past years has reached 15 feet, nearly touching the chandelier. 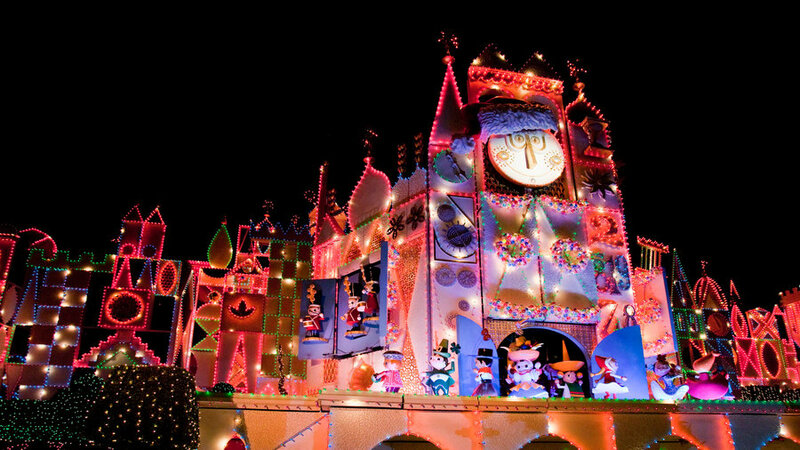 Another of Disneyland’s main attractions gets a festive spin each winter to celebrate the diverse holiday traditions of its multicultural cast. The beloved ride’s exterior is strung with 300,000 LED lights, and as guests embark on the musical cruise, they’ll hear holiday favorites from around the world. Some of the dolls even don festive garb, and their spirited chorus will leave you humming holiday jingles for days to come. 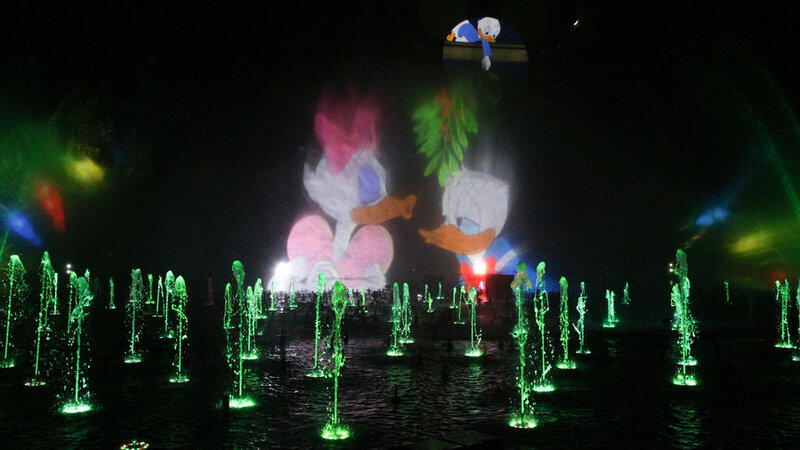 California Adventure Park’s year-round evening show gets a jolly twist in “World of Color – Season of Light.” The magical event event over Paradise Bay is a grand display of light, water, and fire set to classic holiday tunes, and highlighted by heartwarming themes of love and family. Take a heartwarming trip down memory lane with accompanying clips from Disney’s most memorable animated films. Each of Disneyland Resort’s three hotels welcome guests with decked-out halls, indulgent holiday menus, joyful carolers, and thoughtful touches that inspire relaxation after a day of thrill-seeking in the parks. Of special note: Disney Grand Californian Hotel & Spa, where the Craftsman-inspired decor is adorned with garlands, twinkling lanterns, and a giant gingerbread house. Tempting treats are in abundance throughout the parks, thoughtfully created so you can enjoy your favorite characters in delicious new ways. 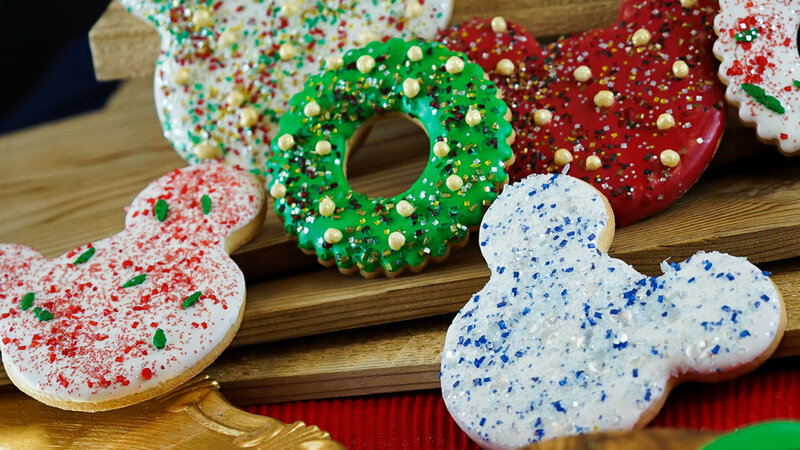 Try a Santa Mickey crispy treat or Olaf Marshmallow Wand from sugar outposts like Disneyland’s Candy Palace or Downtown Disney’s Marceline’s Confectionary. On select days, don’t miss the hand-pulled candy canes, which sell out quickly for a reason. 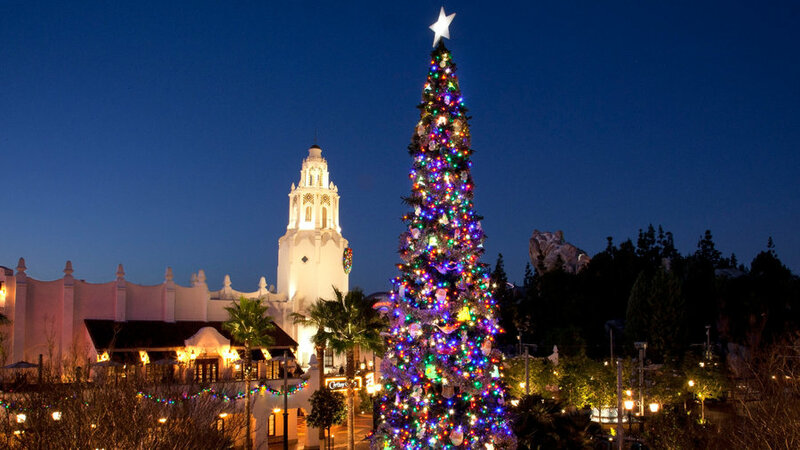 Disneyland’s Town Square and California Adventure’s Buena Vista Street are must-sees thanks to their magnificent Christmas tree displays. California Adventure’s Buena Vista Street hosts a 50-foot beauty adorned with vintage-style ornaments inspired by how Los Angeles looked when Walt Disney first arrived in the 1920s. 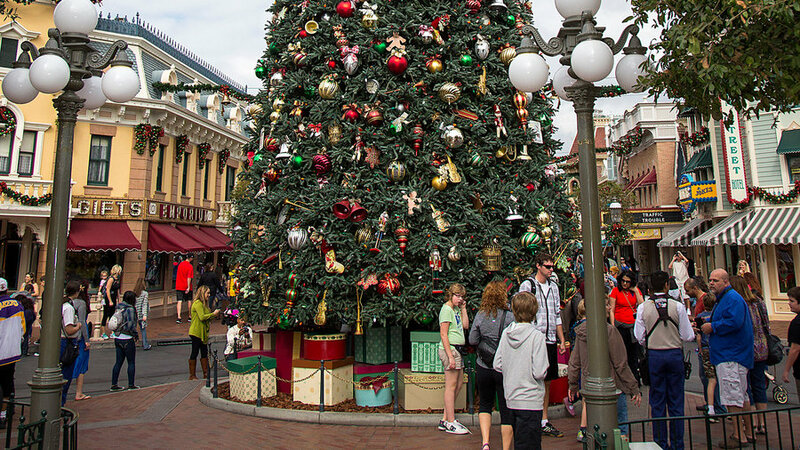 In Disneyland’s Town Square, the six-story tree twinkles with thousands of lights and roughly 1,800 ornaments, making it a perfect spot for a family holiday snapshot. Browse the many shops along each of the parks’ main drags for seasonal merchandise and Mickey-themed stocking stuffers, or enjoy the holiday menus at the surrounding restaurants. 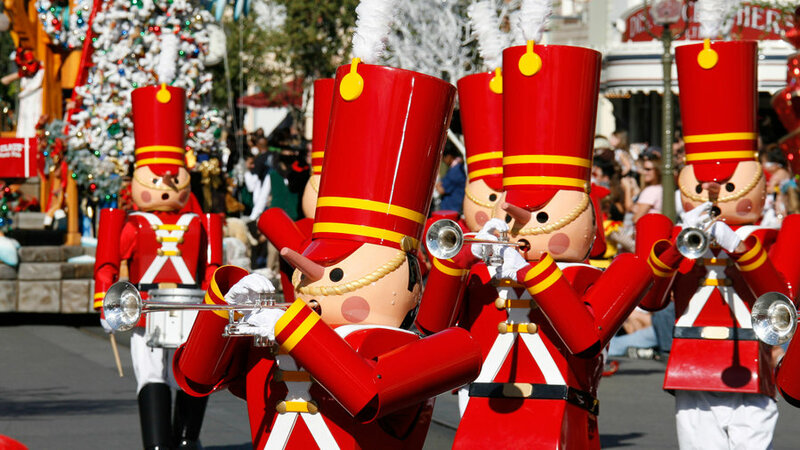 All of the Disney characters come to life at the daily “A Christmas Fantasy” parade, featuring floats, holiday music, and marching tin soldiers along with a very special guest, Santa Claus. Pay him a special visit at his Disneyland home in Critter Country, or find him, along with his elf squad, on California Adventure’s Redwood Creek Challenge Trail, which is outfitted with a series of fun holiday-themed games and activities for the whole family to enjoy. 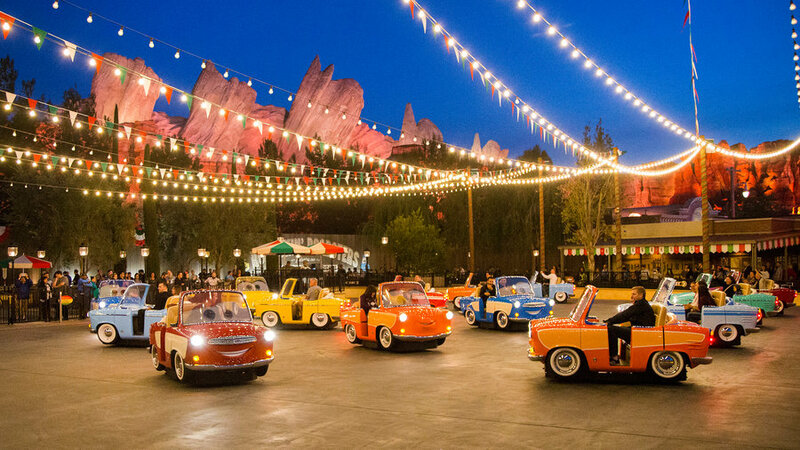 Visit Lightning McQueen and his fleet of friends at their home in Cars Land, which is decorated in the season’s finest. Guests at Radiator Springs will be greeted by an auto-inspired spin on a snowman, complete with a traffic cone nose, and will delight in seeing Route 66 decorated with holiday flair. 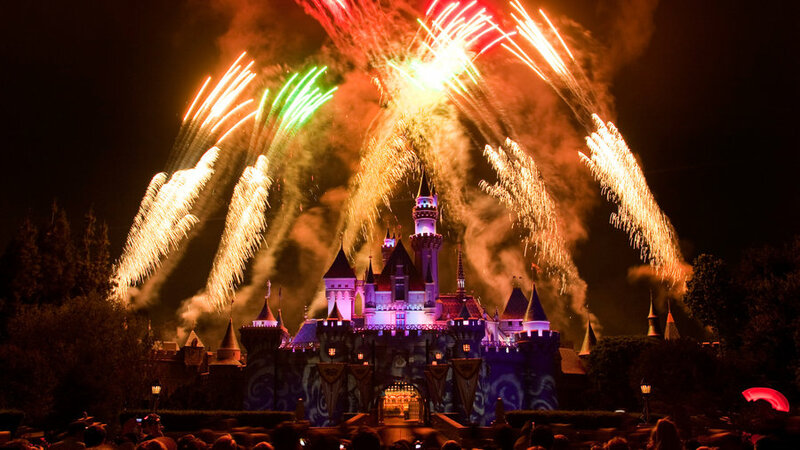 A day at Disneyland would hardly be complete without a firework spectacular over the park’s crown jewel. Each winter, the magical Sleeping Beauty Castle is illuminated with string lights and the recurring “Believe…in Holiday Magic” show, featuring booming fireworks and a magical snowfall finale.